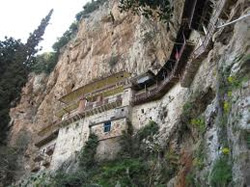 The new Monastery of Philosophos, which was built in order to replace the earlier, Byzantine one, lies in the western part of the Lousios gorge and was founded at the middle of the 17th century. The catholicon (main church) is a cross-in-square domed church of the composite, four-column type, with plain facades and poor brickwork decoration. The wall paintings inside the church are dated to 1663 and are the work of Victor, a representative of the Cretan School. The church also has an impressive wooden-carved iconostasis. The new catholicon was built by the monks of the new monastery and was painted at the expense of Mavraidis Pasha from Stemnitsa. From the mid-17th to the mid-18th century the new monastery housed the school of the Gortyn clergy which was attended by important people of the Church (e.g. Patriarch Gregory V). Between 1834 and 1836 the monastery was abolished with the decision of the Bavarian regency, its property was confiscated and sold to individuals. 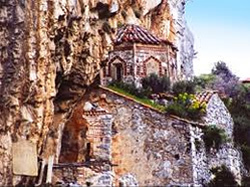 Today, the monastery is used as a convent for monks, and is a department of the Monastery of Timios Prodromos (St. John the Forerunner) at Stemnitsa. 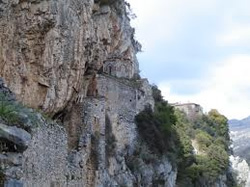 Many religious buildings have been located in the gorge of Lousios, including churches, monasteries, hermitages as well as secular buildings such as water-mills, gunpowder-mills, tobacco-mills etc. Some of the most important religious buildings are the Old Monastery of Panaghia (Our Lady) Philosophou, built in the 10th century, the Monastery of Timios Prodromos, dated to the end of the 16th century, the Monastery of Aimyalon, the old and new monastery of Atsicholos and St. Andrew at Gortyna.